He's limping strangely down the hall with outstretched arms and a groaning drawl. A zombie! Could it really be? You race to class, but turn to see he's sitting in the desk right next to you! But odds are you'll probably be okay, because this is no ordinary zombie. This zombie doesn't want to eat your brains--he wants to eat your books! And he's not a picky eater with a taste for all genres from mystery to history! But when the zombie catches a whiff of the school library, the children need to come up with a plan fast before all their books become history! This monster book is silly and fun, with a strong message about kindness and friendship. The little zombie teaches kids not to jump to conclusions and to give everyone a chance. This is the perfect monster book for little ones who want a thrill but aren't looking for anything too scary. I Want to Eat Your Books is a monstrously fun story not only for Halloween but all year round! Karin Lefranc grew up living in four countries, but she's finally settled down in Connecticut with her husband and four children. She attended Bard College in New York and had the opportunity to travel the world again while working for IDG Books helping to license the For Dummies® series into over thirty-five languages. Karin is also a certified children's yoga teacher. This is her debut picture book. Tyler Parker received his BFA in illustration from the Maryland Institute College of Art and also has an MA in Sequential Design and Illustration from the University of Brighton. He is the illustrator of more than seven children's books including Monsters Meet on Mondays and The Ice Cream Shuffle. He currently resides in Seattle, Washington. 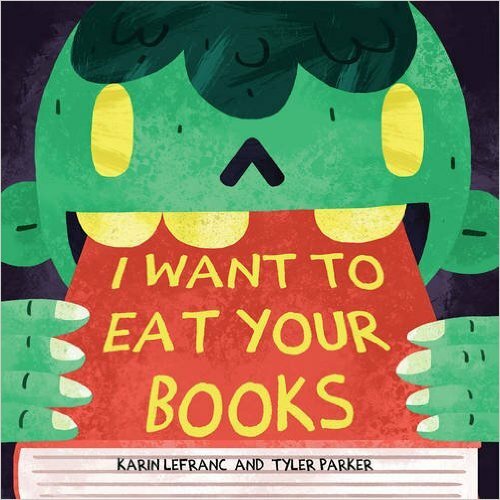 I Want to Eat Your Books by Karin Lefranc and Tyler Parker is such a fun book! I love books that have messages and the message in this book is wonderful! The little monster zombie isn't your ordinary zombie. He's a zombie that can't resist the smell of a good book. The message in this book teaches kids not to jump to conclusions and to give everyone a chance. I think it's a terrific message! My kids really enjoyed this book and loved the silly illustrations and the fun story to go along with them. This is a wonderful book, that's perfect for the month of October or any other time of year! You can find I Want to Eat Your Books on Amazon, Barnes and Noble and other bookstores.